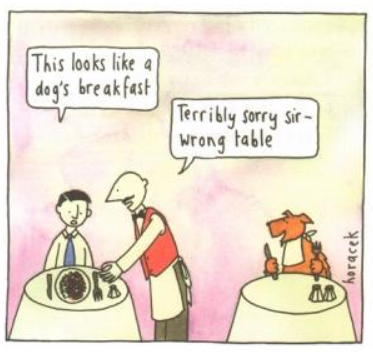 Origin: Since the 1930’s, the saying “dog’s breakfast” has been used in the U.K. and Commonwealth countries as slang for “a complete mess.” First recorded instance is from Eric Partridge, in the 1937 edition of his A Dictionary of Slang and Unconventional English, the expression is listed as “a mess.” Although the origin isn’t exactly known, it alludes to the fact that if what you don’t succeed at what you are cooking, then the results are only fit for a dog. It’s usage can be widespread – from what a messy room looks like, to how a meeting went (like the example above). It is suggested that this dates from a time before canned dog food when a pup’s breakfast would have consisted of dinner leftovers from the night before; hence, “a mess.” Not to be confused with a parallel expression “a dog’s dinner” which means quite the opposite and usually comes in the form of “all dressed up like a dog’s dinner” and sarcastically means over-dressed / showy.